This piece by Justin Fox at BloombergView is just one example of the increasing discussion of the move towards empirical work, away from theory, in economics. 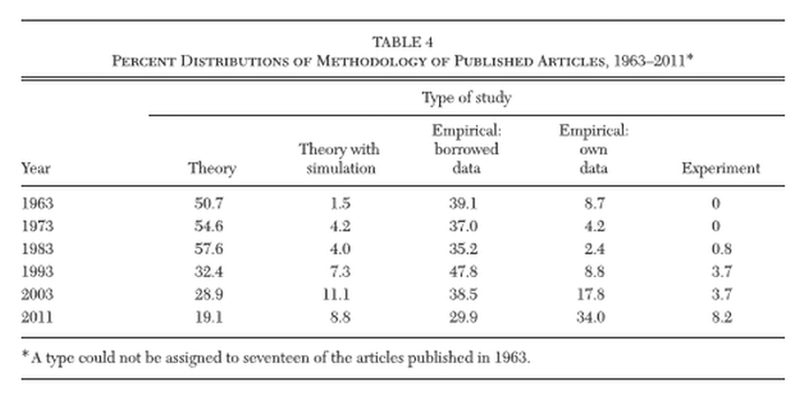 This table from Hamermesh (2013: 168) shows the changing nature of research in economics: the amount of theory being published is decreasing while the amount of empirical/experimental work is increasing. A final point about the models of the firm discussed in this book is that they highlight a general issue to do with post-1970 microeconomics; namely, the retreat from the use of general equilibrium (GE) models. The theory of contracts has evolved from the failures of general equilibrium theory. In the 1970s several economists settled on a new way to study economic relationships. The idea was to turn away temporarily from general equilibrium models, whose description of the economy is consistent but not realistic enough, and to focus on necessarily partial models that take into account the full complexity of strategic interactions between privately informed agents in well-defined institutional settings. What is interesting about the these changes is that they consist of a move not towards a new general equilibrium theory but rather a movement back to partial equilibrium models. By the mid-1970s microeconomic theorists had largely turned away from Walras and back to Marshall, at least in so far as they returned to using partial equilibrium analysis to investigate economic phenomena such as strategic interaction, asymmetric information and economic institutions. If we take as an example the theory of the firm one can clearly see this move away from general equilibrium. Foss, Lando and Thomsen (2000) offer a classification scheme to help understand the modern theory of the firm. The scheme divides the contemporary theory into two groups based on which of the standard assumptions of general equilibrium theory is violated when modelling issues to do with the firm. The theories are divided into either a principal–agent group, based on violating the 'symmetric information' assumption, or an incomplete contracts group, based on the violation of the 'complete contracts' assumption. A benefit to these changes in the approach to theory is that these changes have helped stimulated the increase in empirical work we see. The modern theory, in areas as devise as game theory, contract theory, organisational theory, asymmetric information, incentive theory, industrial organisation etc, has lent itself to empirical/experimental testing in a way that the older theory didn't. So theoretical and empirical work has changed together in a way that is mutually reinforcing. Of course these changes have come with costs as well as benefits. For example, partial equilibrium models can obscure the importance of the theory of the firm for overall resource allocation, a point which is more easily appreciated in a general equilibrium framework. Foss, Nicolai J., Henrik Lando and Steen Thomsen (2000). 'The Theory of the Firm'. In Boudewijn Bouckaert and Gerrit De Geest (eds. ), Encyclopedia of Law and Economics (vol. III, 631–58), Cheltenham, UK: Edward Elgar Publishing Ltd.
Friedman, Milton (1955). "Leon Walras and His Economic System", American Economic Review, 45(5): 900-9. Hamermesh, Daniel S. (2013). "Six Decades of Top Economics Publishing: Who and How? ", Journal of Economic Literature 51(1): 162-72. Salanie, Bernard (2005). The Economics of Contracts: A Primer, 2nd edn., Cambridge MA: The MIT Press. Walker, Paul (2016). The Theory of the Firm: An overview of the economic mainstream, London: Routledge.